» Want to buy an old church? Want to buy an old church? The old Cumberland Presbyterian Church at Main and Santiam in Albany. If you’ve always wanted to spend tons of money on acquiring and restoring an old church, here’s your chance. The city of Albany plans to invite proposals along those lines for a building at Santiam Road and Main Street, which the city bought for a road project but now doesn’t need after all. 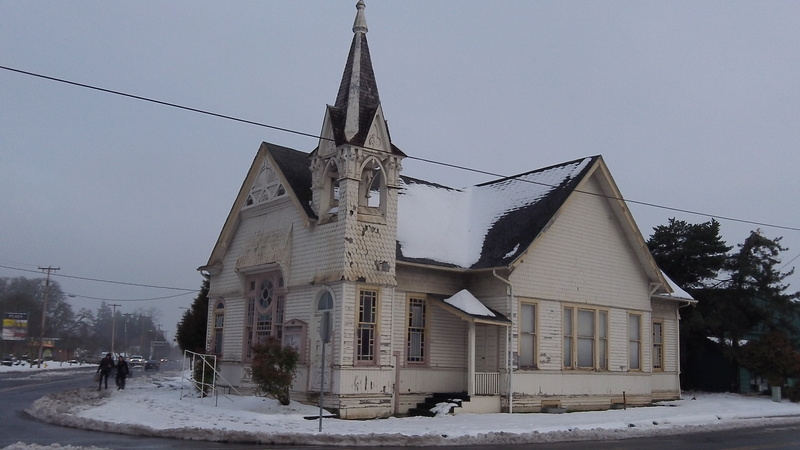 Albany bought the historic Cumberland Presbyterian Church in 2000 for $150,000 because officials thought part of the property would be needed for the right of way to improve the Main-Santiam intersection and rebuilding the nearby intersections of Main Street with Third and Salem Avenues. The design of that project, to be constructed in 2014, has changed to a round-about, and the church property won’t be needed. The property is now surplus, and on Monday the city council talked about what to do with it. The church has been vacant for years, and the city says it has spent about $5,000 on basic maintenance for each of the last two years. Chris Bailey, assistant public works director, estimated that fixing the building to make it usable would take around $100,000. The city has already received three offers, but details were not disclosed. Bailey and economic development director Kate Porsche recommended that the council consider not just the best price but also the potential uses. Some of the proposals involve financial help from CARA, the downtown urban renewal district, which includes the property. Ideal spot for a police station! Hope it can be saved! Would be nice to raze the old Salvation Army store behind it so the church would have parking area. Certainly would improve that part of town to have the church restored. Perhaps the City should think of possible uses for the building…Senior Center East?